Orus’ unique patented optic controls the light emission bending and shaping the light directly onto the road. Using only 35W version the light distribution in this example provides the perfect substitute for 250-400W traditional road lighting. 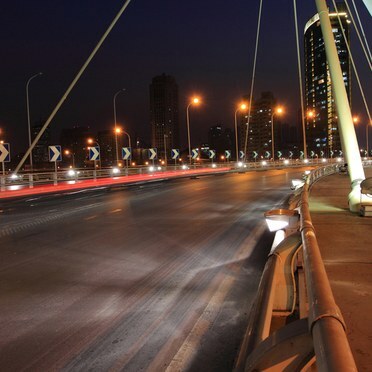 Ensuring light is concentrated on the road provides the required high levels of illuminance while using minimal energy. Orus’ FlatBeam technology helps to cast more than 93% luminous flux to the road. Precise optical control and luminaire aiming eliminates upward light and ensures no energy is wasted lighting the wrong area. By eliminating upward light, ecological disturbance is also minimised. Located in the central business district of Tianjin Downtown, across the Hai River, Chifeng Bridge is the only inclined pylon double plane harp cable-stayed bridge in China. With a unique shape and complex twists and turns, it's Tianjin's landmark. 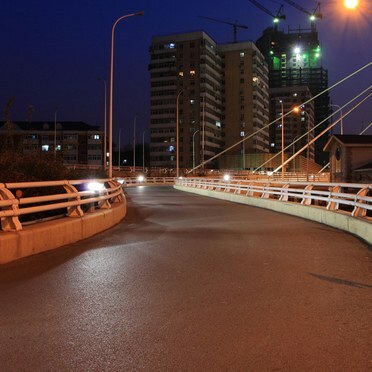 Yet, despite its aspirational design, Chifeng Bridge was experiencing several lighting issues. 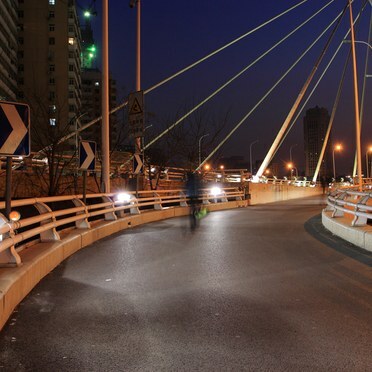 Following extensive field research to explore and demonstrate a series of lighting solutions, Thorn's Orus luminaire with its patented FlatBeam technology was chosen to refurbish Chifeng Bridge's lighting. Orus has a special bi-directional optic, resulting in a unique light distribution which projects light transversally to the road. With a 35W HIT-CE lamp, it also offers excellent uniformity with no glare and low energy consumption. Above all, Orus has a mounting height of 0.9m to ensure no direct light enters vehicles and access and maintenance is significantly easier. The low mounting height also complements the bridge's extravagant design. For low maintenance, Orus is constructed from high quality vandal resistant materials and engineered for a long operating life. The use of an electronic ballast further enhances energy savings and increases lamp life expectancy. 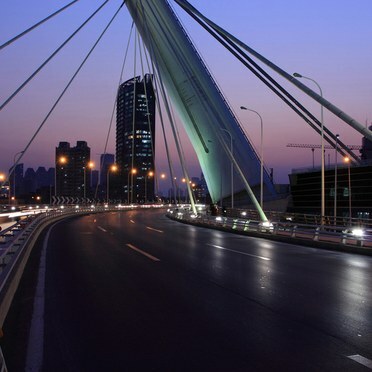 Michael Han, the Lighting Designer at Thorn, says: "Orus offered the ideal lighting solution for Chifeng Bridge. As well as providing an ideal mounting height, the optical system offers a very sharp and controlled light distribution while optimising the efficiency of the lamp. The use of ceramic metal halide lamps with 35W was the best choice in terms of light control, driver comfort and power consumption."